Move right in to this Like-New, Custom built, elegant one story. Wood floors throughout! 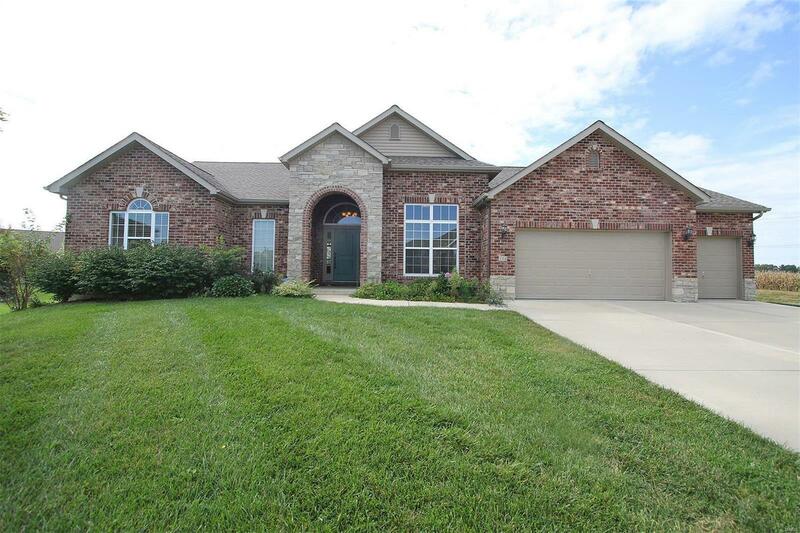 Enter into the spacious foyer & living room w/ soaring ceilings. See thru the full wall of windows to the covered porch. Formal Dining room with french doors has 12 foot ceiling, coffered ceiling w/crown molding. Gourmet Kitchen has massive granite island & is fully equipped w/Fisher-Paykel gas cooktop, built-in oven/micro, french door refrig/freez.,& flooded w/ natural light. Opens to Family/Hearth Room w/ gas fireplace. Conveniently located laundry w/ pocket door, washer/dryer, built-ins, utility sink. Sought after split bedrooms-The private Master wing has a huge walk in closet, entrance to the patio, & plush bathroom featuring dbl sinks, garden tub, walk-in shower, private commode. Add'l beds share full bath. Full basement has tons of finish potential-egress window ready for 4th bedroom, roughed in bathroom. Oversize three car garage. Located on quaint cul-de-sac. Ready for immediate occupancy.